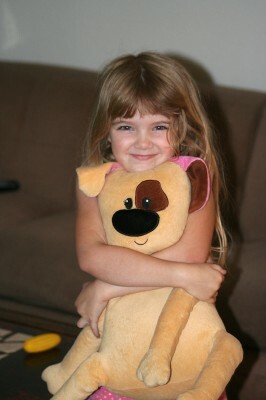 I think most of us have at least one special stuffed toy from our past that we will never forget. For me it was this big pink stuffed rabbit named Fluffy that had long floppy ears. A close runner up was my purple elephant, Dumbo. Amara has lots of toys, both here and at home. 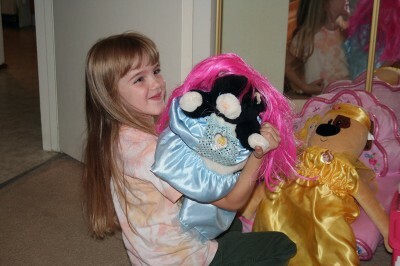 Two that I know she will always remember are Spot and Kitty. Spot was a gift from our friend Taunia the Christmas of 2007. 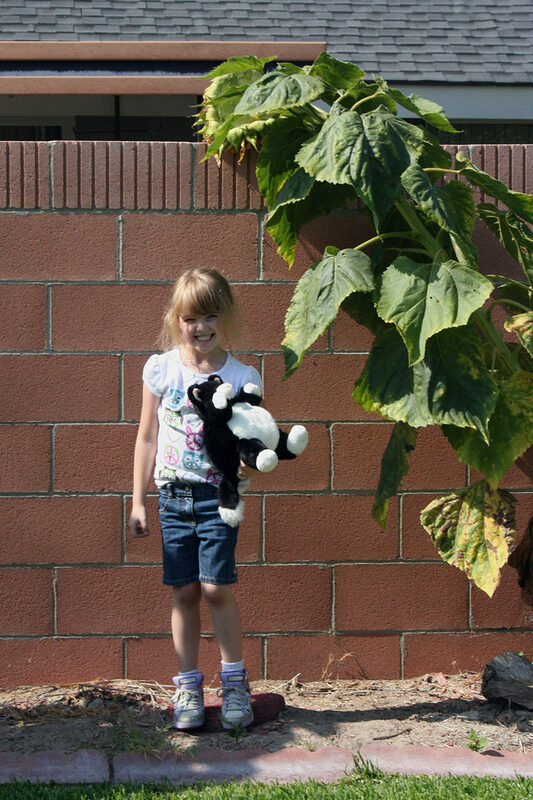 Spot is a wonderful stuffed dog with a spot over one eye and Velcro on all 4 paws. That means you can Velcro Spot around your leg and go for a walk, it means you can Velcro Spot around Grandpa’s head, and it means you can easily Velcro Spot into a swing. 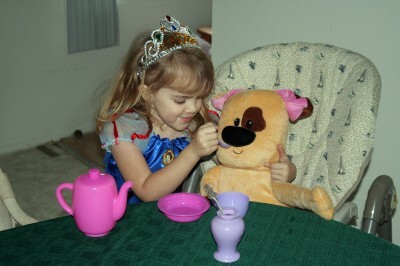 Spot has been to many tea parties. He will sit and watch as you frost cakes. Spot has also been used as a mannequin when Grandma Kc is sewing Halloween costumes. Sometimes Spot stays at Grandma Kc’s but sometime he stays at home. 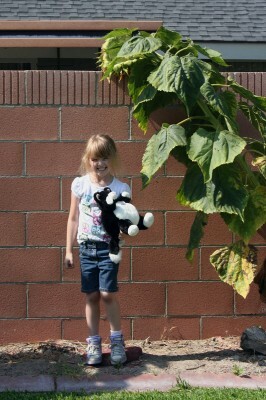 The other toy Amara will never forget is Kitty who is a very overstuffed black cat with a white tummy. Kitty has a name tag on her that says Amara and was a gift from Mom and Dad that they got at the OC Fair last year. Kitty comes to visit us sometimes when Amara spends the night. There was at least one occasion when Amara forgot and left Kitty here and it was panic time! Spot has had to endure some embarrassing moments but this weekend was probably his worst. 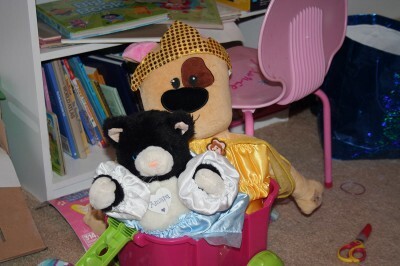 Since Amara is starting to outgrow all of her Princess costumes this weekend she dressed up Spot and Kitty! She had a blast and I just sat back and watched! Both Kitty and Spot wore wigs and later had tea. They even slept next to her in their costumes and the party started all over again in the morning. 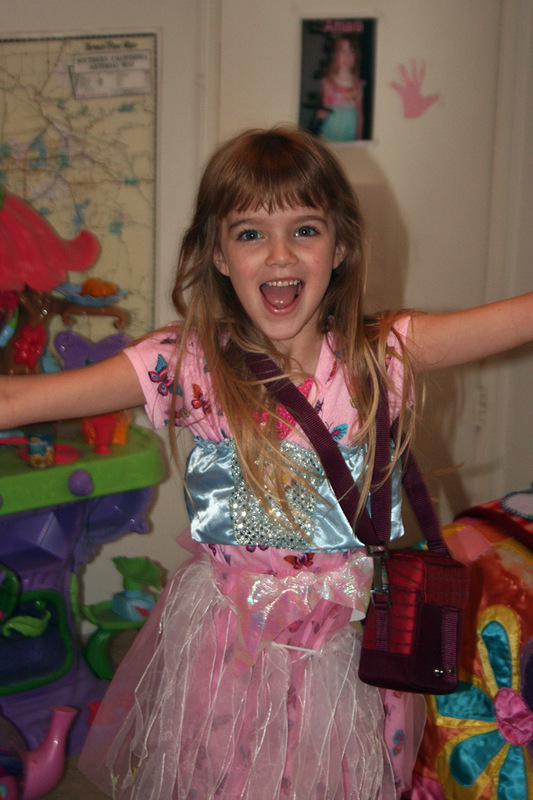 In fact, they were having so much fun that Amara put on some of the costumes OVER her pajamas! What wonderful memories. This memory was posted in Backyard Fun, Indoor Fun, Special Occasions and tagged Amara, Christmas, costumes, Princesses, swingset, toys on July 6, 2010 by Grandma Kc. She’s a very funny girl that one!!! She must take after her Mother — who is not only funny but completely amazing!!!!!!!!!! And now it’s 2012 and she’s eight. What a wonderful eight years it’s been. Amara is so cute in all her pictures ! That is funny! If Amara were to attempt to put costumes on our cats — it would be Amara wearing the pained expression! 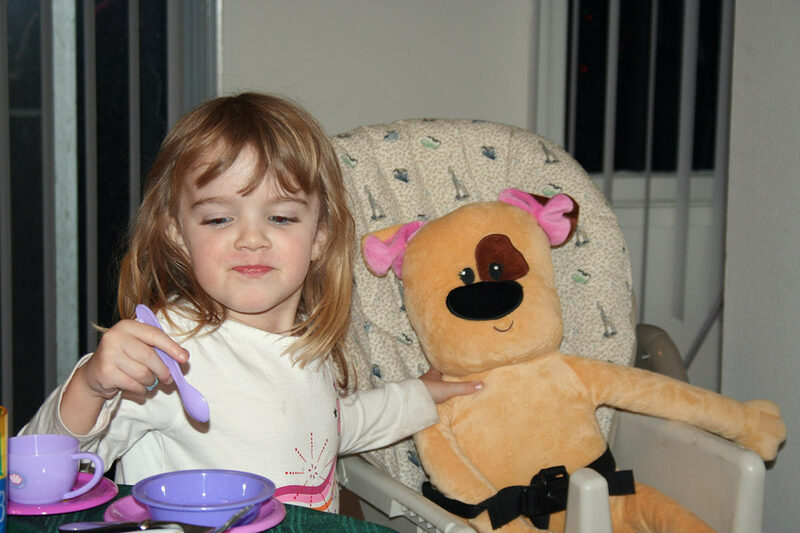 It’s a good thing well loved stuffed animals can’t talk – what stories they would tell. Wonderful Grandma KC, made me laugh. Amara is a lovely girl, thanks for sharing part of her life with us. Spot and Kitty sure look GRAND in their costumes. Of course, Amara looks grand in hers, too, as she always does, even when jammies are part of the outfit. Thank you for linking to the GRAND Social. It’s always such a joy to see Amara past compared to Amara now.